Preheat oven to 425 degrees. Once hot, place cookie sheet on bottom rack to heat up. In a large mixing bowl add flour, sugar, cinnamon, nutmeg, allspice, and salt. Whisk until well blended. Add thinly sliced apples, zest, and juices to sugar mixture & toss until all apple slices are coated. Let sit for 15 minutes, until apples release their juices. Meanwhile, cook 8 strips of bacon until very crispy. Cut into ½-inch pieces. Combine bacon and cheese with apple mixture. Arrange coated apple slices, bacon, and cheese into a 9-inch unbaked pie shell. Cut extra pie crust into ¾-inch strips. 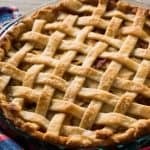 Arrange on top of apple pie, about ½-inch apart, to create lattice top. Bake on cookie sheet for 50-55 minutes or until pie filling is bubbly and crust is golden.